Smart keyboard controllers that integrate with software have been something various makers have tried frequently over the years, with various degrees of success. Propellerhead helped lead the way with Automap in Reason, which could cleverly link on-screen controls to devices. But by the time this was translated to multiple pieces of software, the resulting “automatic” features could be harder to use on than off. I tried at various points Novation’s ReMOTE, M-Audio’s Axiom Pro, and Cakewalk’s A-PRO keyboards, and found them all to be perfectly nice hardware – once I gave up and turned the automatic stuff off and just mapped MIDI the old fashioned way. I know I’m not alone on this, as I’ve heard frequently from readers in comments. And then there’s Native Instruments’ Komplete Kontrol. At first glance, it looked nearly perfect. Tight integration with NI’s software means automatic hands-on control with no additional configuration. The design is attractive. The keybed is top-notch (it’s a simple synth action, but the best one available, the Fatar). I’ve been using the 25-key model, and it’s a lot of fun – doubly so when you use it alongside Maschine. And that’s why Akai Advance looks interesting. The keyboard, scheduled for delivery in spring, at least promises to do more with its whiz-bang premium features. Some of this definitely takes more than a few pages from NI’s playbook. You get light-up color pads (like Maschine), a big color display (like Maschine Studio), a software host that manages presets and control parameters and integrates with the keyboard (like Komplete Kontrol), and “smart” knobs with automatic assignments and text feedback as to what you’re controlling (like Komplete Kontrol and Kore and Automap and all the rest). You even get an NI-style launch video, and a user interface on the computer screen and hardware that visually looks like recent NI products. But I followed up with Akai to better understand what we can expect this spring, and the Advance line also promises to do some things that other rivals don’t. Some promising signs from the magic 8-ball (aided by some actual information researched from Akai since this announcement appeared). 1. You get a full color screen. Right now, keyboard users are limited to simple text displays. 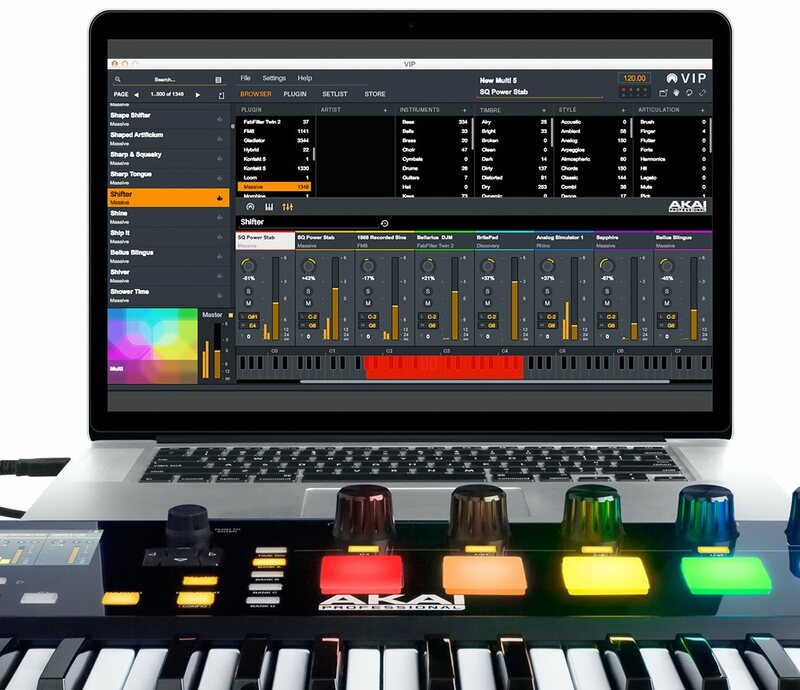 Advance one-ups that with a bigger display closer to what we’ve enjoyed recently for Traktor and Maschine. 2. It has a good keybed. Lately, it’s been unclear what the Akai brand means to InMusic as far as feel and build – products like the entry-level APCs cut some corners to reach bottom-basement prices. 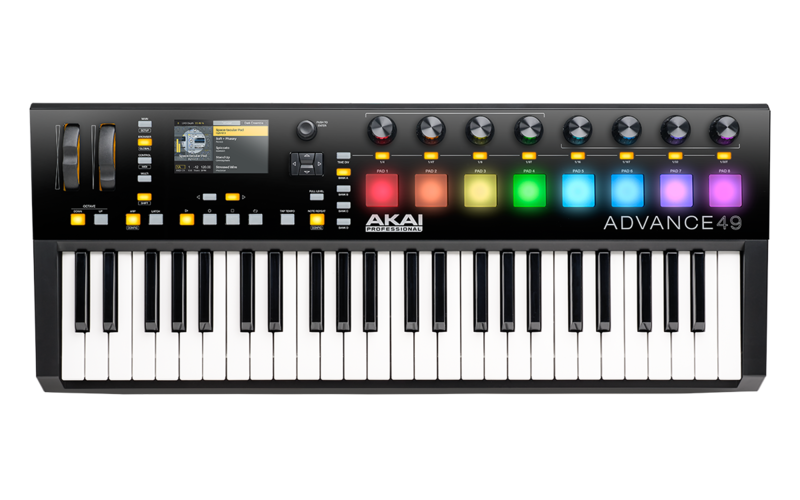 Not so with Advance: InMusic reports Advance will use the quite-nice keybed from the MPK249 / MAX25. No bonus points here versus NI, but at least a reasonably even match (depending on your taste). 3. It has conventional pitch and mod wheels, and pads. These rubberized wheels also felt great on the MAX. And pads, while not useful to everyone, certainly appeal to some of you. 4. The software is included. 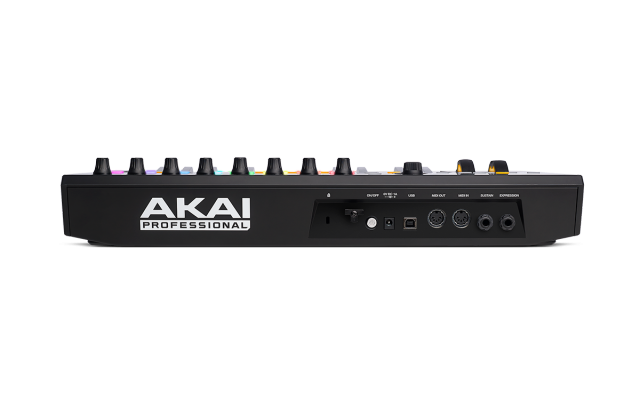 Unlike the Komplete Kontrol, which inexplicably tells you to go buy Komplete if you want more than bare-bones MIDI functionality, Akai is giving away some great software (alongside the included host, which they call VIP.) Vacuum Pro, Loom, Hybrid 3, Xpand!2, Velvet and Transfuser by AIR Music Tech, plus Eighty Eight Ensemble by SONiVOX are all in the box. A couple of those AIR plug-ins are some of the best available, so this is no basic freebie. 8. — but it doesn’t turn into a brick if your computer isn’t switched on. Yes, Advance works as a standalone controller – as it should. To anyone working with hardware synths, this is a must, because you don’t always have your keyboard tethered exclusively to your computer. So those MIDI DIN ports work even without a computer connected – unlike NI’s Komplete Kontrol. You only need an (optional, but standard-issue) power adapter. 9. It’s not ugly. Akai’s MAX series was I think the best keyboard controller in recent years, and it still merits your attention. It has innovative programmable touch strips that do cool things like control your DAW or act as a step sequencer – even standalone. It has CV built in. Unfortunately, it’s also glossy fire engine red, which will offend some sensibilities. 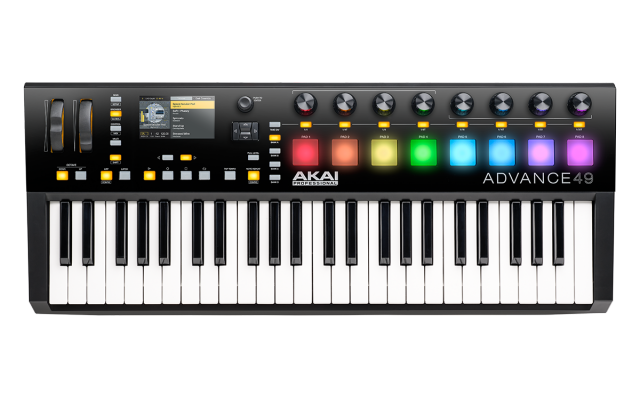 The Akai Advance looks more tasteful, at least in early product photos. Now, the unknowns – and they’re important to note. 1. Some of this is only on paper. “Spring” isn’t here yet, so we have to guess at how they handle execution. 2. We don’t know how much software will be supported, or how the software will work. This, too, remains to be seen – and it’s been in the execution details where other efforts have failed. 3. We don’t know how the pads will feel. “MPC pads” according to AKAI currently seems to mean “square and made of rubber.” So that’s something to actually review and test. 4. You won’t be able to make use of those cool colored pads – at least right away. I had fantasies of programming step sequencers via MIDI using those pads. 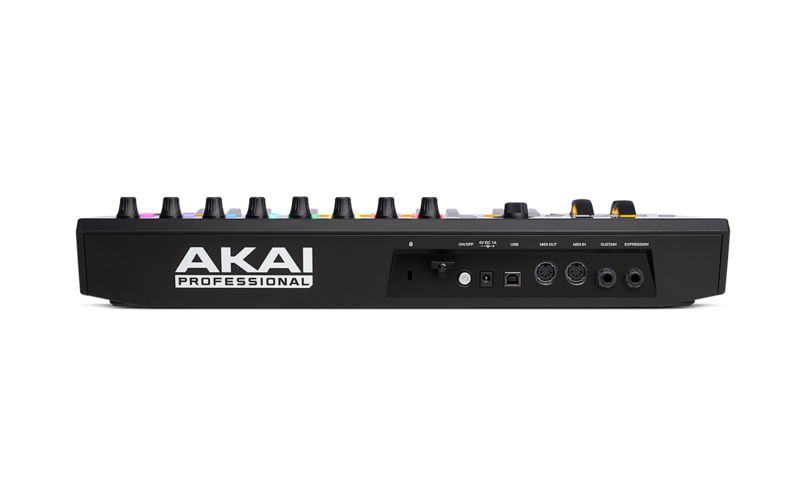 But you’ll have to wait: Akai tells us “color editing via midi is something that will hopefully come in a later update, but will not be supported when shipping.” I’m also curious to see how they use the display when you’re in standalone mode. 5. It’s NI’s move. Native Instruments has already shipped Komplete Kontrol. Standalone operation is presumably out of the question, since the hardware relies on a software host for MIDI capabilities. But NI could improve integration with its own software and third-party software. So, we’ll see what they do, and how it stacks up. 6. Maybe a “dumb” keyboard is just fine. You can get a number of perfectly reasonable keyboards with knobs and pads and assign MIDI knobs – for a fraction of the price. Sure, you might not get a color screen or fancy features. But… you might not need those things. 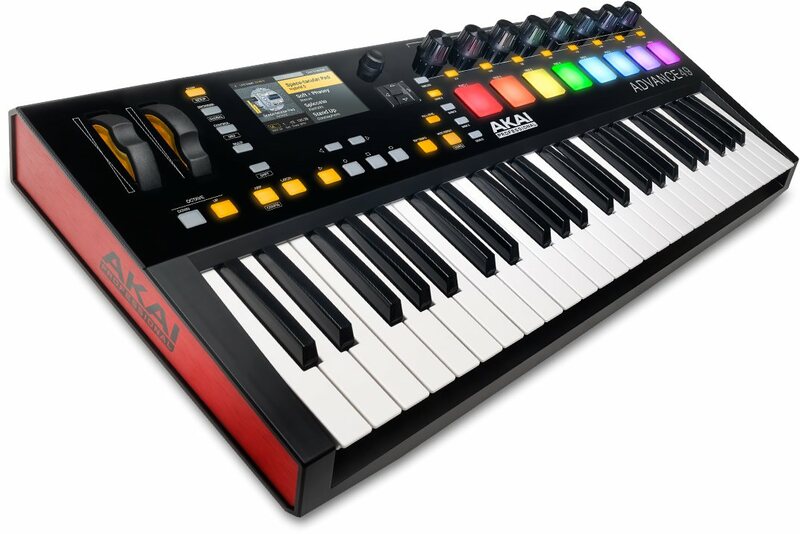 So, we’ll see if Akai succeeds where other keyboards have (for some, at least) faltered. Still, all that said, I’m glad to see AKAI enter this market. It shows they’re still committed to making mid-range, serious MIDI controllers to follow up the MAX, not just entry-level keyboards branded Alesis, Akai, and M-Audio. And there’s a chance to provide some of what Komplete Kontrol does, but without being locked in to one brand’s. And the pricing is aggressive: US$399.99 for 25 keys, $499.99 for 49, and $599.99 for 61 keys, with loads of software. Of course, none of that means anything until they ship this and prove that the hardware design and software functionality are on target. But it’ll be one to watch in 2015.